Besant Technologies is one of the leading institutes in providing short term professional courses. We offer various software testing courses handled by experienced professionals working in various MNCÃ?Â¢??s. We also provide hands on training on the testing tools deployed in various companies. We offer these courses in an affordable price along with flexible timings. ""I have joined here for Selenium Training at Real time experts Porur. Now i am working in a MNC company after the training. They gave excellent support while training and resume preparation. I 100% recommend this porur based institute for your Selenium testing Training in Besant technologies at porur. " "I am learning Python training here( Besant technologies porur). 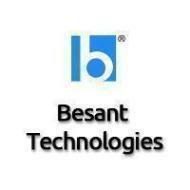 Faculty is so good and they are giving enough knowledge to students to make them perfect and helping them in interview process, thanks Besant technologies. " "I have completed my Java training from Besant technologies at porur. The faculty is too good and i could easily learn the details of the course from them. I am also very happy with the laboratory practical classes because we all were given personal systems. Thanks to Besant technologies. " "Best Java Training in Chennai besant technologies Porur branch. Very good faculty and staff very helpful too and it would be even better if you provide reference the course.they are providing with real time projects. So thanks for my trainer and besant technologies Porur branch. " Besant Technologies Porur conducts classes in .Net Training, Amazon Web Services and Angular.JS. It is located in Porur, Chennai. It takes Regular Classes- at the Institute. It has got 737 reviews till now with 100% positive feedback.